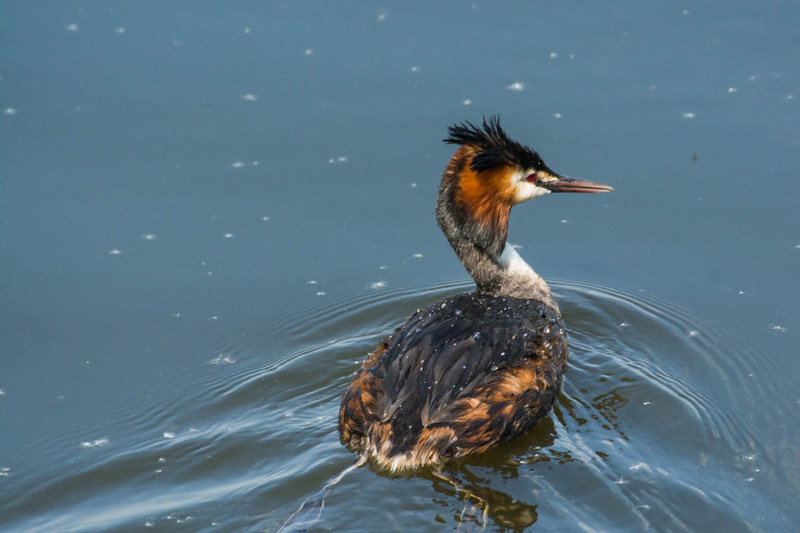 Here is a photo of a great crested grebe, you can learn more about the bird on Wikipedia. It’s easy to find them in Germany, and when you see one, there is a hight chance that you can watch them hunting for fish. They are great divers, and you often see them with a fish in the beak when they come up to the surface. In Germany they have a funny name, we call them “Haubentaucher”, literally translated it means something like “Hood diver”, where the “Hood” refers to the funny “hairstyle” of the bird I guess. He looks like a very colorful version of our cormorant. They are great fishing birds. All black and they are such great fishers, that they have taken over a lot of shore areas.